WARNING: The following article contains spiritual information as well as information about the 5th Dimension, if you are in an organized religion, do not fear this, it isn't evil at all, but with this information you could get to a higher level of understanding. step more into the acceptance and unconditional love of another. Pleiadian in their soul are here on earth now are musicians of one sort or another. They are trying to bring frequencies to earth that will aid the balance of emotions. harmonies that instruments just cannot. and oceans. They sing songs that call all the earthy dolphins and whales to them. transmute it into feelings of bliss and contentment. are many inhabited planets orbiting these stars, housing a variety of different beings. There are two major groups of beings, one is Humanoid and the other is Reptilian. notice that they are exceptionally beautiful, often with large almond shaped eyes. are recorded in many of the myths and stories of ancient people. beam them at a certain point in the third dimension. they are moving as a whole system into the frequency of unconditional love. love, here to Earth as a possibility in reality. into the energy field of the Pleiades. The Pleiadians can live to a much longer age than we do, here on the Earth. religions were based on experiences that humans had with these Pleiadian Gods. colours to aid in an intense healing process. Close your eyes and try to remember and imagine the most beautiful temple. interest in colour. I am sure you will find your own unique way. The Pleiades are a cluster of beautiful, dazzling stars located in the constellation of Taurus. With a telescope, you can see about one-hundred stars. Without a telescope, you can see only six or seven stars. According to ancient legends, the stars are said to be sisters and the daughters of Atlas. The entire Pleiades cluster is actually the eye of the bull in the constellation of Taurus..
Before reading the below article, I think it I should mention that the Cherokee are not the only people related to the Pleiadians. Many people who have light colored hair, large eyes, light eyes (including grey,) etc. The seven bright stars that helped guide Greek sailors are: Alcyone, Merope, Celeno, Taygeta, Sterope, Electra and Maia. They have been known for thousands of years, surrounded by fascinating legends and stories even to this day. The American Indian Religious Freedom Act was passed in 1979. Amazingly enough, up until that time, Native Americans were illegally forbidden to practice their traditional rituals and ceremonies. You may wonder what Native Americans have to do with the Pleiadians, but the stories are in their legends, much of which has been encoded, kept secret or hidden. 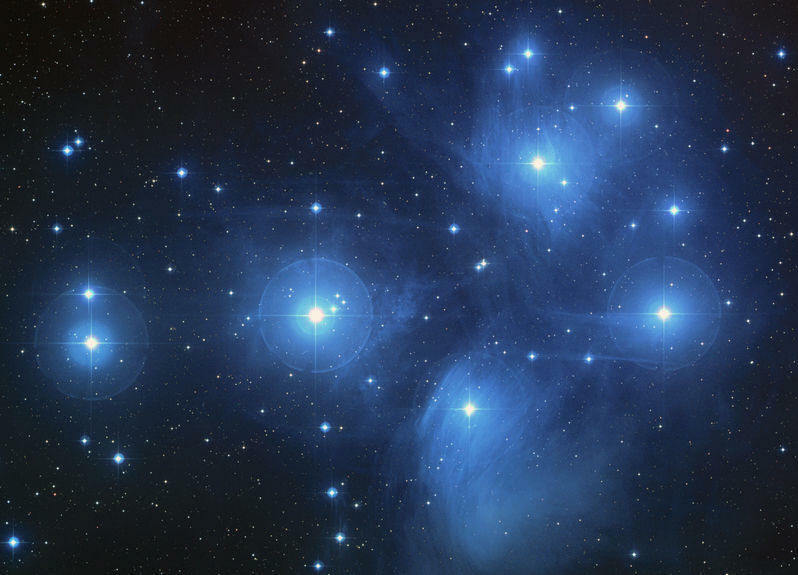 In certain Cherokee legends, it is said that their people originated in the Pleiades long, long ago. They claim to have come to this world as Starseeds to bring Light and knowledge. If the stories are true, then modern day Cherokee, as well as other Native Americans, and many of us with Native American blood contain Pleiadian genes! Certain Pleiadians are highly evolved, more so than most of the human species. The Pleiadian Realm is the next step or level in our human evolution. It is for this reason that certain knowledge is being given to us by specially enlightened Pleiadian beings. There are those that want to help us toward our higher spiritual destiny. These Special Pleiadian Forces reside at a very high frequency that is lighter than what we know. And thus, the term Light is often applied. The higher and lighter the frequency, the closer to the God source one becomes. Eventually, all will become Pure Light at the center of creation, which is God or Spirit or whatever name you choose to call it. As we evolve, gaining wisdom and true understanding about our real essence, we begin to open up more to Love, and to feel our connection with one another and the universe. In the Earth realm, Love is only experienced and known at a low level compared to all that truly exists. The God/Spirit frequency is beyond anything we know. It is Pure Love - It is is Pure Light. As we strive and come closer to that center of creation, we will know Love completely and be totally In the Light. Although in physical time, the Pleiadians are 541 light years away, they have learned to navigate other worlds, although not always in space ships. They understand our fear of the unknown, and so they come to help in ways that are non-threatening. They are coming now, sometimes in physical form where they can blend in, but most often through human consciousness. Their intent is not to harm but to help us evolve and develop. The Pleiadian Message and action is not always one that you might comprehend at first. Thinking with a purely human mind, you might imagine that they will fly in on some sort of spacecraft. It is often difficult or impossible for the human mind to grasp the scope of what is not familiar. Tuning into higher wisdom does not always mean greeting an alien or a spacecraft. Try thinking about time concepts if you will. Suppose that the past, present and future all exist at the same time right now. That certainly is not an impossibility if you consider time travel. Suspend that thought for a moment....time travel. Time travel is possible through consciousness. So often, this is how wisdom and higher information is passed to us. Without crossing the barriers of time, the human race would get stuck and stay right where it's at. It is through the Crossing of Time, that the Higher Pleiadian Forces of Light bring us information. This information is vital in our spiritual development. Certain Pleiadians have chosen as their work, a very noble and serious purpose. They strive to work through the layers of human consciousness to bring higher wisdom from the place they dwell at. They are not God, yet they bring wisdom, as many have brought wisdom throughout the ages from higher realms. Their purpose is not to save your soul, but to enlighten you more to the power and beauty of who you are, and to the divine creation of which we all are a part. People or so called Channelers that bring in certain information are in no way divine or special. They are simply willing to tune into another place, another time and receive information. Many humans have always had the capacity to do that. There will be some that will actually take that chance and put it out there for others to partake of. Thank you for reading and please subscribe.